44th & Goal: THIS… IS … SPARTA! Currently, the Brewers are in Southern California to play the Los Angeles Dodgers. 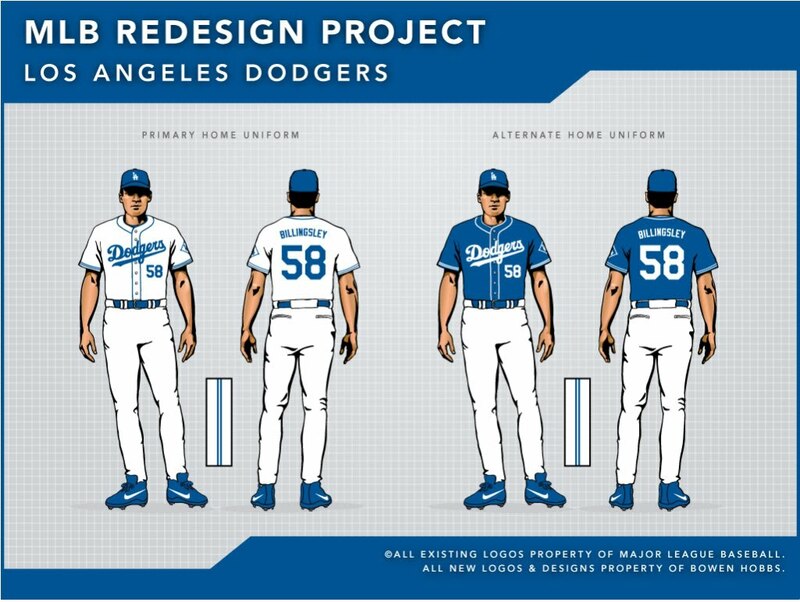 With that in mind, I have decided to show my concept for LA's NL team. 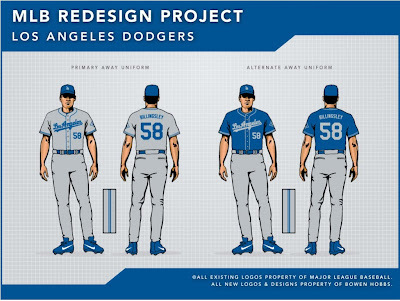 The current scheme relies heavily on the classic scheme of blue and white, while sometimes adding grey or silver. The one color choice that has always bugged me, however, is the sporadic inclusion of red. It appears on the primary logo and on the numbers for the front of the jerseys. I have never understood the red; it turns a classic, unique scheme into just another blue and red team. In the concept, I sought to eliminate the red and focus on blue, white, and grey, just like the Brooklyn days. My version of the primary logo replaces the red with grey and adds a diamond holding shape from the team's history. 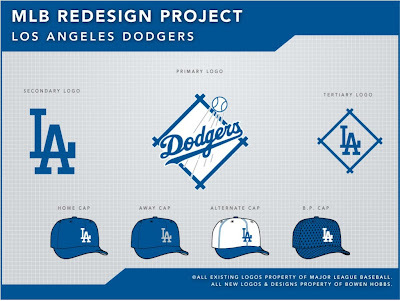 I kept the LA logo as the secondary, as it wouldn't be prudent to change it. I have also added a tertiary logo of the LA inside the retro diamond, which appears as a sleeve patch. The red on the uniform numbers dates back to the tradition of the Dodgers being the first team to have numbers on the front of their jerseys. Since having the numbers is the historical "first", I kept them, but made them blue to eliminate the senseless red. I also took their plain uniforms and added a placket piping design that evokes memories of one of their greatest players, Jackie Robinson. All the uniforms, except the Sunday Alternate uniform and Batting Practice jersey, use the retro-inspired piping. The road sets introduce a new cap with a grey LA to create a more cohesive set with the rest of the uniform focusing on the interaction of blue and grey. I generally find the use of white on baseball road uniforms to be superfluous, and in many cases it inhibits teams from creating distinct looks that inspire thoughts of the game's storied past. 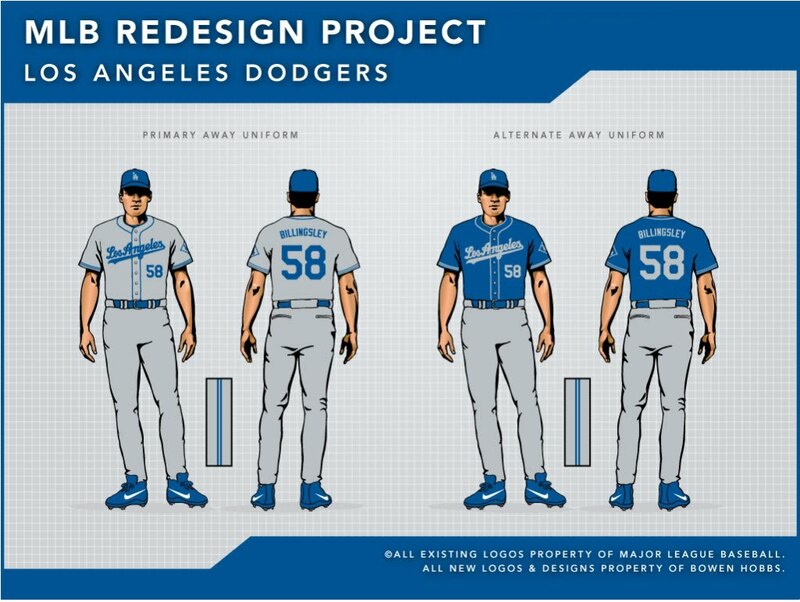 The away jerseys utilize the "Los Angeles" script, currently on the team's away set. 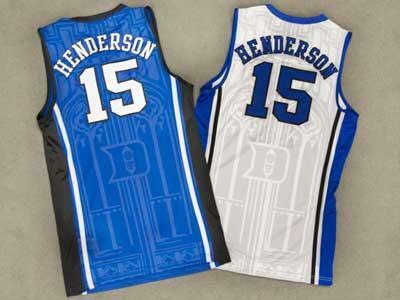 The Sunday Alternate gives fans a plain uniform base, but jazzes the set up with the white faux-back cap. The common themes throughout the concept are history and minimalism. Feel free to leave a comment on Michigan State's new brand, the Dodgers concept above or anything sports branding related.